Have you ever wanted to learn to do a craft and just never been able to accomplish it? For the longest time, that was learning how to crochet for me. I have been knitting since I was in elementary school, but the lure of the hooking kept me going back and trying every so often. I bought books and even had several people try to show me how. Then, YouTube videos really made everything click. Since early March, I have hardly held my needles, instead a hook has been in my hand most of the time. After making one cloth with some cotton yarn, I jumped into trying to make crocheted granny squares. I used colors from a project I was recycling and then slowly added more colors. When I wrote my last post about the project at the end of May, I had used seven yarn colors and was debating what to do. Since that time, I used two additional colors. 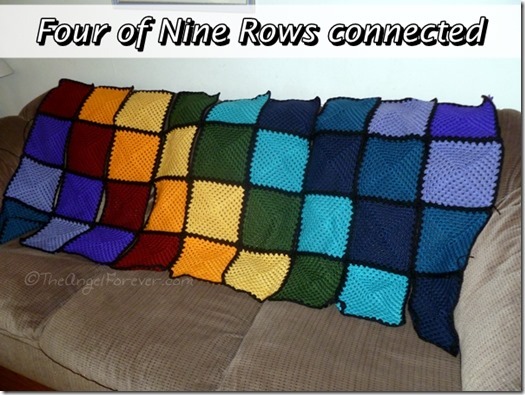 By July 1, I had finished making 81 granny squares in nine colors. Each square has ten rounds and are rather large, especially after a border round of black was added. 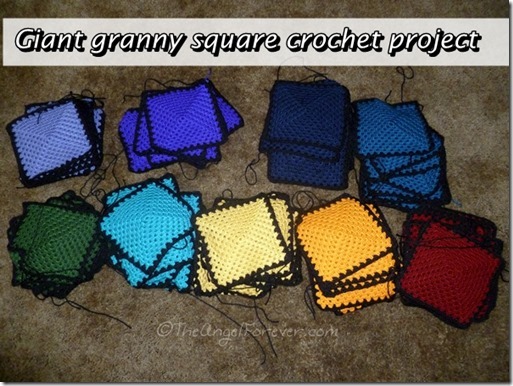 When the squares were finished, I brought them to Nana and Papa’s house to spread them out on their floor. 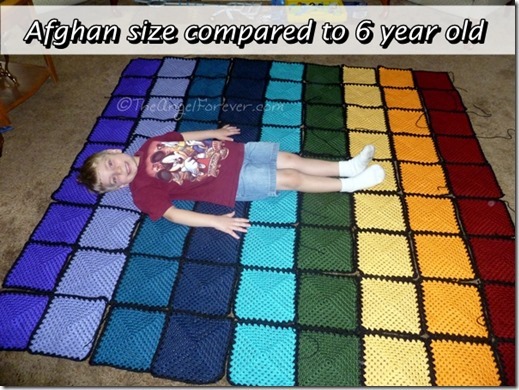 I was not entirely sure how large the afghan would be. I had measured it on our queen sized bed, but it was a guesstimate. As you can see, I placed the squares in a rainbow like pattern to begin. This was the easiest way to go. After that, I changed it up a little. With TechyDad’s help, we moved them around and came up with a second option. Both of these can be seen below. In the end, TechyDad and I both liked the more funky pattern. 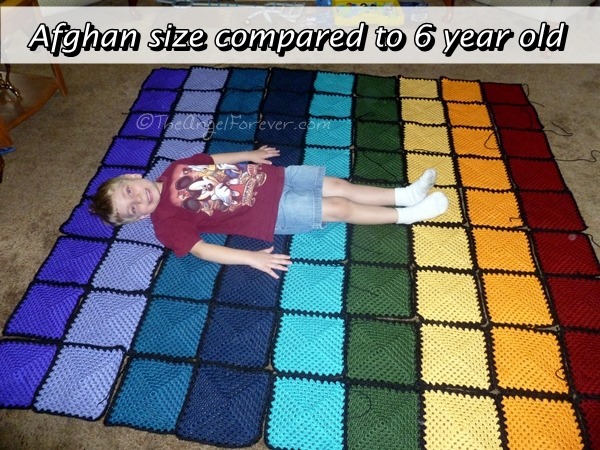 As I mentioned before, this is my crochet project of any size really…and it is huge! Putting this together scared me a little since I have never done anything like it. Thanks to the crochet tutorials on YouTube from The Crochet Crowd, I was able to watch Mikey explain how to single crochet connect them. 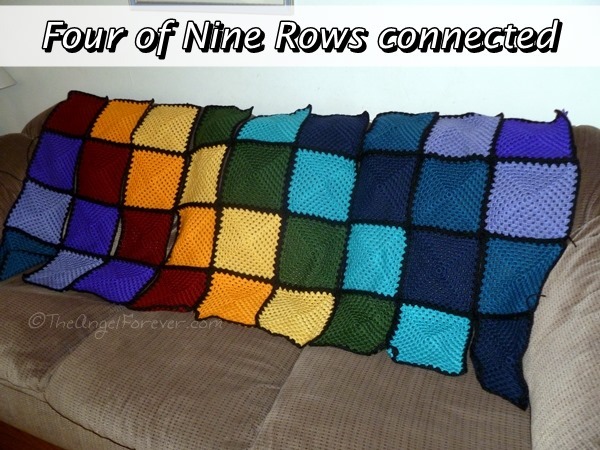 Before I knew it, I had four rows finished. I took it over to our couch to share a sneak peak of the afghan. More work continues and I hope to finish soon. Then, I really want to finish the afghan that I was knitting. I’m not sure what I am going to do after that, but no doubt I will figure something out. 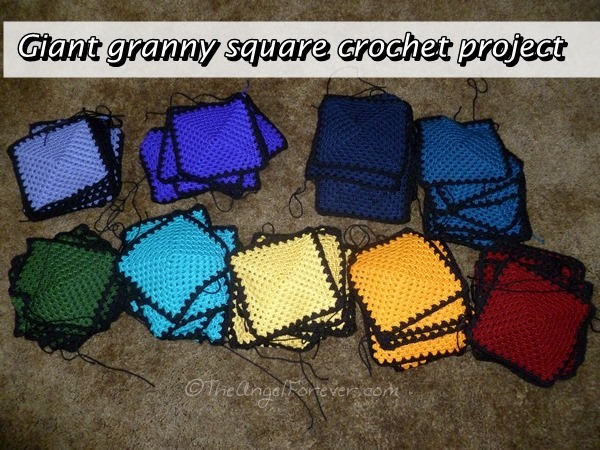 If you have any favorite crocheted projects, I would love to know. I am always looking for new items on Pinterest, Ravelry, and other locations.